Three hundred and seventy-five people attended the Careers in Aviation Expo on April 28 at the Jazz Aviation Hangar in Mississauga, ON, which represents the highest number of attendees for the seventh-annual event, designed to foster the future of aviation in Canada. This included dozens of secondary and post-secondary students looking to build careers in the sector. Three weeks later, more than 75 students from across Western Canada and 120 people in total turned out for a smaller, but more interactive Careers in Aviation Expo in Edmonton, Alberta, held within the recently built – 2012 – hangar and facility of Aurora Jet Partners. The Careers in Aviation Expo (CIA), hosted by Wings and Helicopters magazines, is designed in large part to help address the labour shortages in aviation. A highlight of the CIA Toronto event was the display of a Jazz Q400 aircraft, featuring one of the first public views of Air Canada’s new aircraft livery design. An Ornge PC-12 aircraft was also on display for attendees to tour; and just before lunch a hangar door opened for the Greater Toronto Airport Authority to back in one of its medium-sized fire trucks – measuring 70 x 20 feet. The day in Toronto featured six educational sessions focused on the future of the workforce in Canadian aviation, kicking off with a keynote by Steve Linthwaite, VP, flight operations for Jazz Aviation LP. He was joined on stage by Dwayne Swartz, base manager for Jazz at Pearson Airport, who shared insight into the daily maintenance and management at one of Canada’s busiest hangers. Jim Armstrong, helicopter pilot and assistant chief flight instructor with Essential Helicopters of North Bay, Ontario, then discussed the opportunities of developing a career in the rotary world. Business aviation opportunities were then presented by Skyservice’s Lyn Shinn, VP, central region and pre-owned aircraft sales; followed by Stan Kuliavas, VP, sales & business development of Levaero Aviation, who also touched on the dynamics of business jet sales. Tim Anderson, owner of Anderson Aviation Services, who is also a professor with Fanshawe College, Norton Wolf School of Aviation, began the afternoon discussing maintenance, avionics and entrepreneurship in Canadian aviation. The day’s final session featured Marissa Duchscher, a Q400 captain with Jazz Aviation discussing her life as a fixed wing pilot. 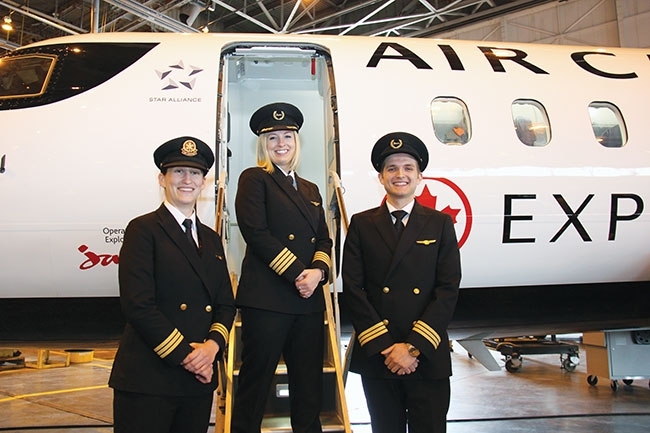 After deciding to be a pilot at age 17, she spoke about her journey that started in 2010 at Seneca College’s aviation program, followed by her 2014 graduation and eventually being hired by Jazz in April 2015. Duchscher was then joined by her colleagues Erin Grant, Air Canada 767 first officer and Jake Kelly-Cuthbert, Jazz CRJ first officer for a Q&A session. The Toronto event was capped off by a prize draw, as Thomas Sandrin, brand manager, Hamilton Watches Canada, picked a name from hundreds of ballots to present a Khaki X-Wind watch. CIA Expo then ran for the first time in Edmonton, thanks in large part to the location provided Morningstar Group, which includes Aurora Jet Partners, as well as Morningstar Air Express and Signature Flight Support. In addition to eight speaking sessions covering a range of insight for aspiring aviation professionals, CIA Edmonton included more than 25 exhibitors who spent the day discussing opportunities in the industry. A highlight took place shortly after 11:00 am when four Boeing CH-47 Chinook helicopters briefly landed in formation on the ramp in front of Aurora Jet, which also brought its Embraer Phenom 100 inside the hangar for the attendees to tour. The ramp also included RCAF’s Raytheon C90A King Air, flown in by KF Aerospace, and a personal turboprop owned by Travis Burrows who flew to CIA Edmonton to discuss his life as a pilot with WestJet Encore. The morning of CIA Edmonton began with a presentation from Bill McGoey, president of Morningstar Group, who shared a range of insights on the state of Canadian aviation. He provided statistics showing that the Canadian aviation and aerospace industries today employ 154,000 people, but that there will be a need for 55,000 additional skilled workers over next seven years (by 2025) because of industry expansion and workforce retirements. McGoey explained, given the current pace of training, only 14,000 of the 55,000 workers needed will be filled by existing Canadian graduates. BizAv YTI plans to reach out to flight schools and post-secondary institutions, organizing presentations that explain what business aviation is and what career opportunities are out there. The first BizAv YTI meeting will take place in Alberta later this year, with a nationwide expansion planned for 2019 and 2020. The day in Edmonton also featured presentations from Curtis Nadon, chief flight instructor at Mountain View Helicopters; Amr Yosry, program supervisor with Rockwell Collins and a ground school instructor; and Kendra Kincade, founder of Elevate Aviation and an air traffic controller with NAV Canada. Just days before the event, Elevate, based in Edmonton, received $426,000 in funding from the Federal government’s Support for Women’s Economic Security program to promote aviation careers with young Canadian women. Careers in Aviation has landed! 2011 Careers in Aviation has landed!